I love oxfords. There, I said it! Since last year I have been very partial to oxford button ups. I think its an easy way to look put together and its super easy! Going to the office? 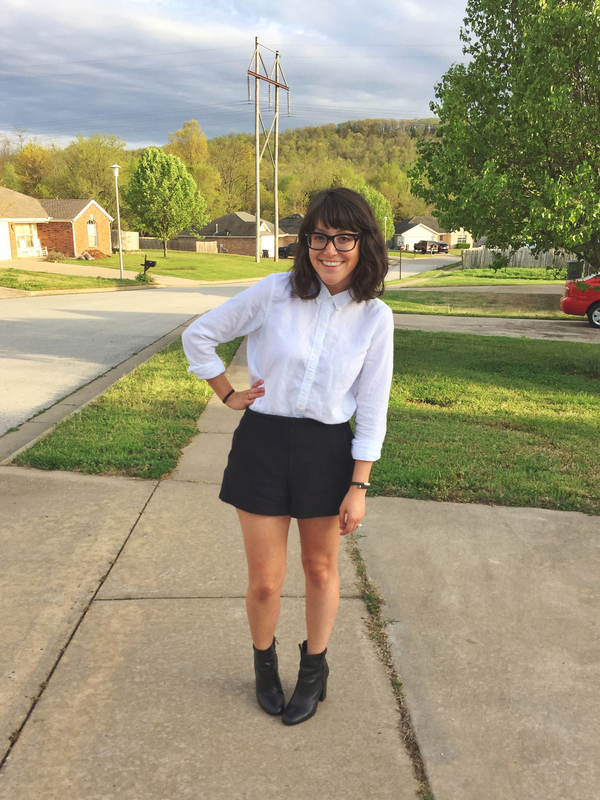 Throw on a crisp, white oxford (I prefer mine buttoned up all the way, a la Alexa Chung- my fashion idol), skinnies, lipstick, and boots and you’re instantly office appropriate, without sacrificing style. Date night? Easy. Switch out your shoes for a favorite pair of heels, maybe slip into a highwaist skirt and front tuck that oxford- done. i snagged those ankle boots for a steal at a dillards sale. 20 bucks for a pair of leather sam edelman boots! As I’ve been getting into my later twenties, I am working on really creating a wardrobe for myself- and I’m learning more than ever that style is truly something one creates personally for themselves- its not about buying whatever happens to be trendy at the moment. Its about wearing what makes you feel like YOU, and what makes you feel best. I want to create classic looks for myself that I can carry into my 30s, 40s, and beyond (yikes!). 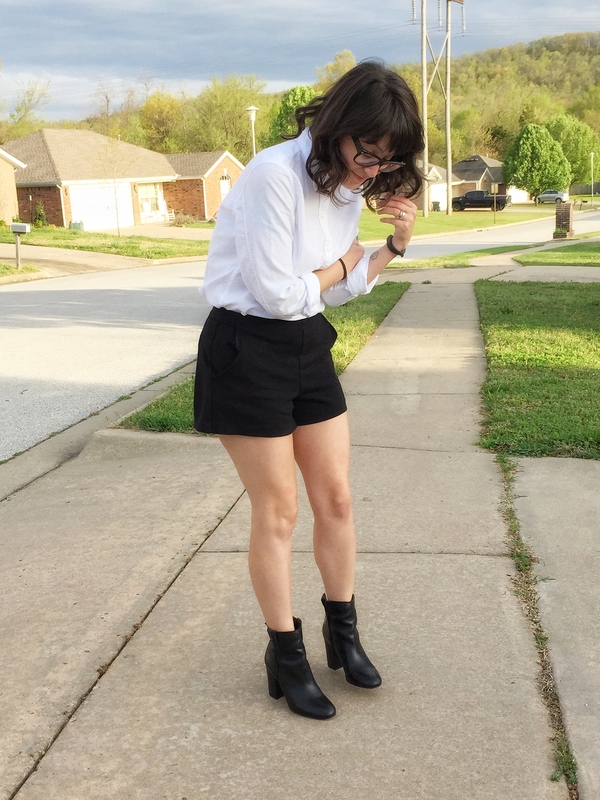 I’ve made sure to have staples like oxfords, high quality pairs of pants (Banana Republic Sloan you guys…seriously), blazers, white tees- things that I can swap out with other clothing items that can create a completely new outfit. The simpler the better- I think that’s how I’ve come to approach my personal style. I may not have 50 pairs of shoes, but I have a dozen pairs of shoes that were initially expensive to purchase, but they are high quality and I know they will last me years and years- I always make sure to take good care of my shoes and take them to the cobbler when they need to be spruced up a bit! Anyway…I’ll stop rambling now! What’s you personal style? What are some things you have changed over the years as you’ve grown? I’d love to hear all about it! p.s. I chopped off 3.5 inches of hair this week….so there’s that! Love this look, very casual and polished! Happy Monday, darling! Looking fabulous, as always! I really love your outfit! Love the cute and classic vibe you have going on here. Perfect black and white outfit! Love it! Thanks girl! Isn’t it hard? Sometimes I want to buy stuff because its on sale but then I stop and ask myself do I really need it? Is the quality even up to par? The struggle is real. Such a cute outfit! Love those ankle boots ❤ you got a great deal on them! There’s nothing better than a crisp white shirt. They’re a timeless piece. There’s nothing better than a crisp white shirt! They’ll always been in fashion I think. Beautiful look! I love oxfords, too! Agh, this look is gorgeous, and it really suits you to a T! you are so sweet! I do know what you mean! Such a lovely simple look! That’s an amazing deal on those shoes! Score for you! I’m absolutely horrible when it comes to taking care of my shoes. Whenever I drop them off to be repaired I always get astonished/saddened/horrified looks from the cobblers. It’s kind of funny but always expensive. I have to do better with that as I move into my later 20s for sure. I really like this look. It a little bit of retro and a little bit of minimalist! So cute! I have to admit, button ups are not my fav right now (sometimes they don’t fit correctly in certain parts! 😛 ) but I think I should give them a shot and just get them tailored. New adulthood goal! girl, i know- one time I was at walgreens getting a prescription and was wearing a button up and the button unbeknownst to me, had popped open in the front so I’m sure the pharmacist was like “what is wrong with this girl? !” yikes!